Cling Stamp from Impression Obsession featuring a cat sitting on a row boat. Cling Stamp from Impression Obsession featuring an ocean themed background, including sailboats, palm trees, and more. 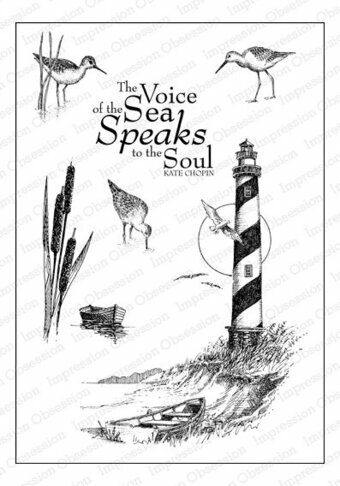 Cling Stamps from Impression Obsession featuring a lighthouse, sea birds, boats, and the sentiment "The voice of the sea speaks to the soul - Kate Chopin". Summer means vacation time. 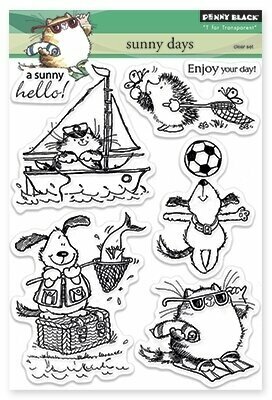 These clear stamps will bring the sun and the sea to all your stamping projects while they cling to our uniquely designed clear stamping blocks-no adhesive needed. They are contour cut and easy to position on any stamping project. Cling rubber stamp featuring a boat shed. Darkroom Door Photo Stamps are mounted on cling foam. Suitable for card making, art journals, mixed media and more! Darkroom Door rubber stamps are known for their durability, deep etching and high image detail. This clear stamp set includes the sayings "The quieter you become, the more you can hear. -Ram Dass", and "Dropping You a Line". Panoramic view of the sea. Includes a horizon border, water border, a sailboat, clouds and a sun. A great set of stamps for your nautical cards and layouts. 6 stamps. Sizes: Smallest: 1.10" x 0.35", Largest: 5.50" x 0.25"